Citizen juries convene panels of everyday people, who are randomly selected and representative, to help elected officials tackle tough policy questions. 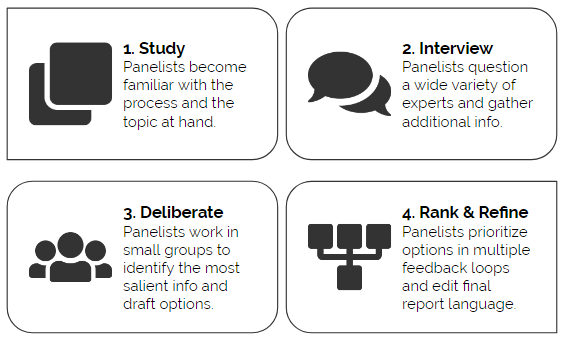 Following a highly structured process, each panel conducts research, interviews experts and staff, deliberates on the reliability of facts, and recommends a course of action to decision-makers. Because the panel is a microcosm of the public – in terms of age, ethnicity, political party, gender, and other factors – its resulting report comes with an inherent legitimacy that sets it apart from conventional citizen committees. 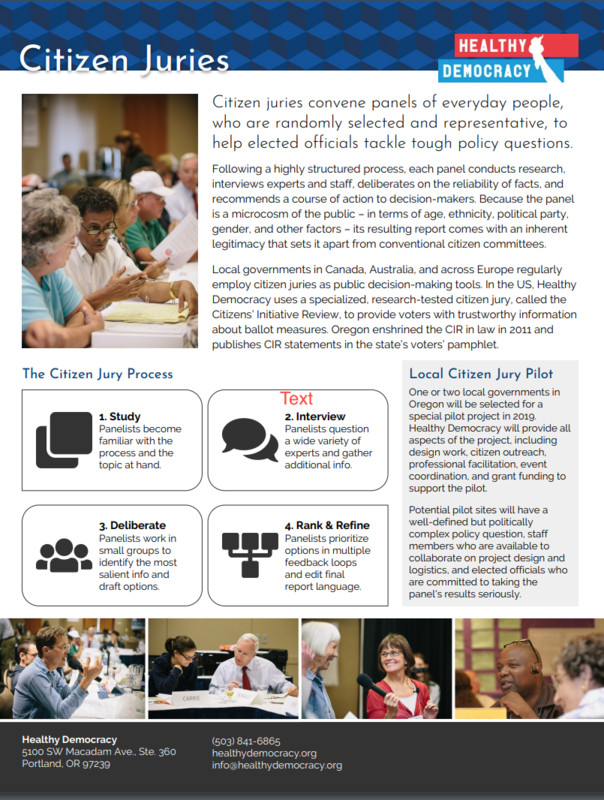 Local governments in Canada, Australia, and across Europe regularly employ citizen juries as public decision-making tools. 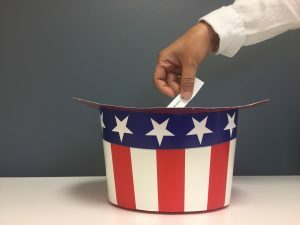 In the US, Healthy Democracy uses a specialized, research-tested citizen jury, called the Citizens’ Initiative Review, to provide voters with trustworthy information about ballot measures. Oregon enshrined the CIR in law in 2011 and publishes CIR statements in the state’s voters’ pamphlet. Our brief introduction to the CJ program and 2019 Oregon pilot projects. We are currently working with the City of Milwaukie, Oregon, to pilot our first local government citizen jury. The project is still in early stages and seeking funding. Look for more announcements soon. Have a difficult or divisive policy question in your city? 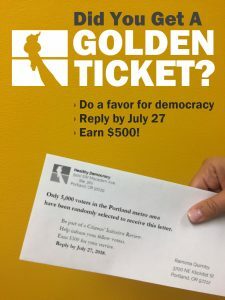 Want to explore a different kind of democratic engagement?